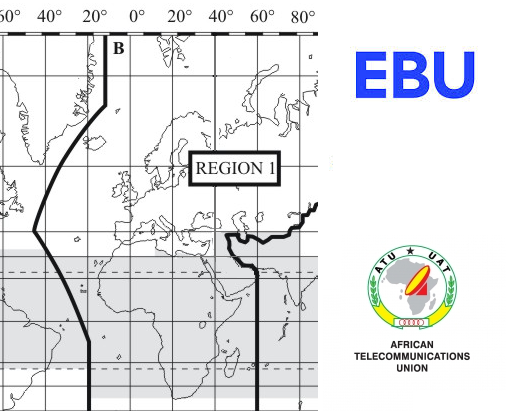 The European Broadcasting Union (EBU) has welcomed the decision of the African Telecommunications Union (ATU) to oppose the use of the lower UHF band for mobile services, thus protecting it for digital terrestrial TV. Decisions about frequency usage in Africa are relevant to European countries, because both continents belong to the same international "region" for the purposes of frequency co-ordination - ITU Region 1. The BBC and other public service broadcasters in Europe make up the EBU, more famously known for operating Eurovision. The ATU represents 46 member states across Africa. At the moment, the 700MHz UHF frequency band currently used for terrestrial TV services such as Freeview is set to be repurposed for mobile broadband services, following in the footsteps of the 800MHz band which was cleared of TV services in the UK in mid-2013. But there has been pressure to allow mobile and TV services to co-exist in the remainder of the UHF frequency band, covering 470-694MHz. The ATU's decision follows moves across Europe to secure these remaining frequencies for digital terrestrial TV. The decision by the ATU was made at a meeting held last week in Nairobi, Kenya. The objective of the meeting was to consider developments since the 3rd African Preparatory Meeting held in January 2015 and to develop African Common Proposals/Positions for the upcoming International Telecommunications Union (ITU) WRC-15 Conference in November 2015, when final decisions about frequency usage in ITU Region 1 over the next decade will be made.